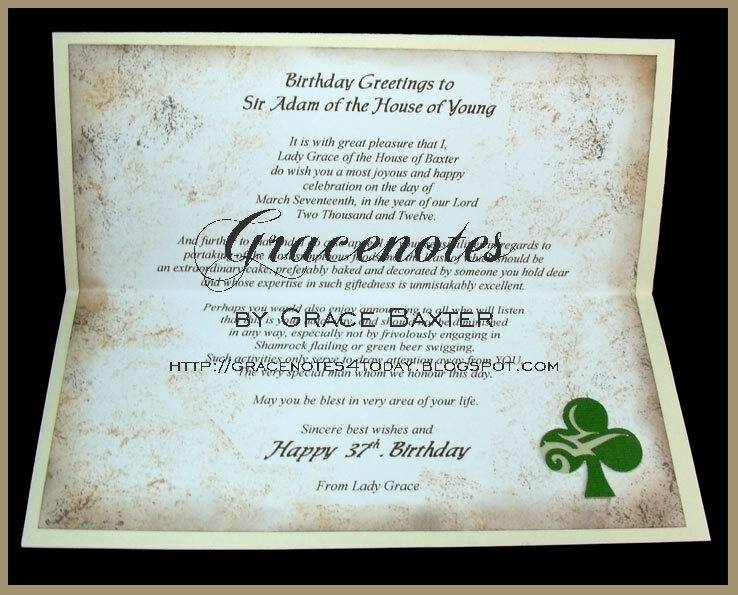 What kind of card do you make for a guy whose birthday falls on St. Patrick's Day? All his life his birthdays have been a combined celebration featuring all things green and St. Patty-ish. Though cheerful and well-loved, this time I went for a unique theme... one befitting his personal interests. In designing this card, I thought about the recipient's interest in jousting, archery, and reading books about characters from the King Richard and "Robin Hood" era. Of course, the verse HAD to be in Old English style. More on that later. It starts with the card shape. I needed it to be long and lean to accommodate the design, 9-1/4" x 4" which is perfect for a number 10 business envelope. The theme of this card is "Old World". 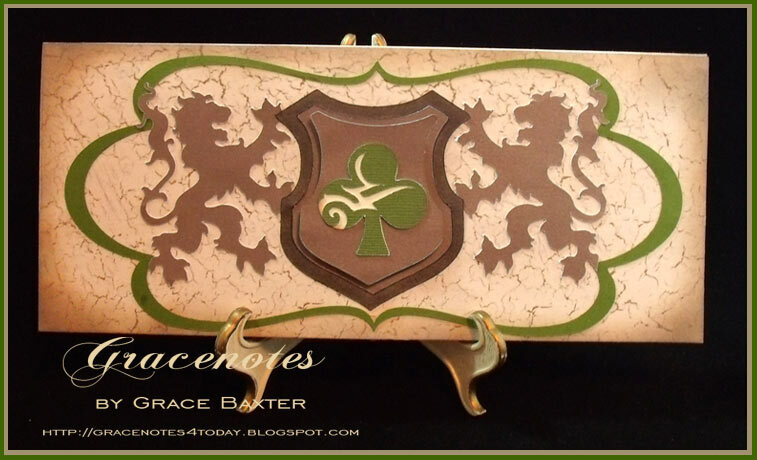 Beginning with cream-coloured cardstock, I covered the front with a crackle paper that resembles stone. Then I aged the edges with ink in black and brown (Tea Dye). The crest and lions are from Indie Art. These are cut from taupe shimmer CS. I love the smoothness of this CS and the slight sheen. Shield with three layers plus the clover (shamrock). In the pic above the shield, the largest shape is actually an outline that did not add any extra thickness. It sits snugly against the smaller shield. For this piece I sponged black ink over the taupe CS. It does darken the colour but doesn't turn it totally black since the CS is non-porous. The top shield is attached using foam dots. 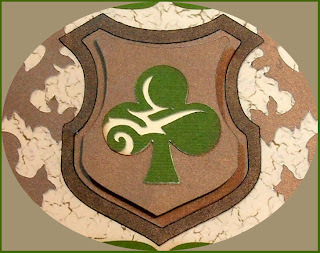 There are 4 layers to the shield including the shamrock. I composed the verse and changed the font colour to dark brown, then printed it on regular white paper. Next, I went to town aging the look of the paper. I used the same black and Tea Dye distress ink around the edges, then stamped more distress all over the page, keeping the typed area fairly clean. One more shamrock finished the inside. This was so much fun to create! I thought about using very old English but after listening to a few clips from a Robin Hood movie, decided to leave out the "thees" and "thous" and use PROPER English. In my opinion, proper English never goes out of style. I even added some subtle humour into the second stanza, which I know won't go unnoticed. This has to be one of my most creative pieces. I loved coming up with the perfect verse to suit the genre and era of this card. I can't wait for the recipient to open his card. I have entered this card in the BBTB2 Challenge for March. The theme of the challenge is shamrocks. 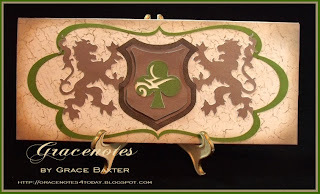 I hope they like my "Old World" shamrock. I'm excited that this card was featured in this week's CHIRP, March 13th, 2012 · Vol. 361. What a fabulous guy card. 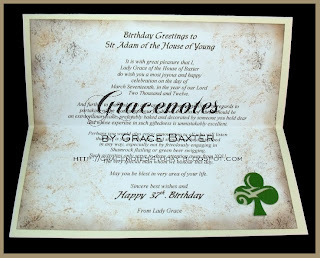 I love the way you combined the birthday with the shamrock. Thanks for playing along at BBTB2. what an absolute wonderful card... Thank you for joining us on our BBTB2 Shamrock challenge. WOW. This card is just fabulous! I love the design, the shield (!!) and the great shading. You did an amazing job with this. Thanks for joining us at BBTB2 this week, otherwise I might have missed this wonderful card!! Beautiful!! What a gorgeous card! Thanks for playing with us at BBTB2! Great looking card for a guy! 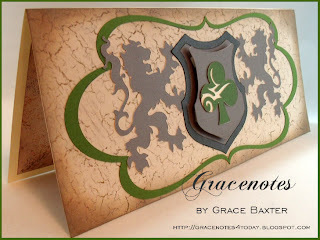 Love the crest with the shamrock! What an awesome card. Thanks for sharing your fabulous work with us. Your card is truly a piece of art. I am new at this stuff and I am always on the lookout for "masculine" since I only have grandsons. It is my daughter and me surrounded by males. I am only interested in cards! I probably won't go to that much trouble, but I did enjoy your card.